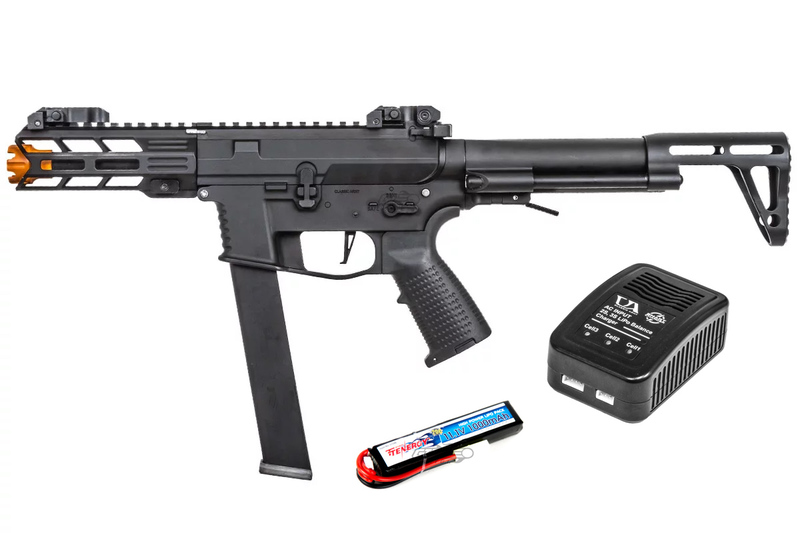 Introducing the Classic Army X9 SMG - the first full metal, 9mm AR-style replica on the market! 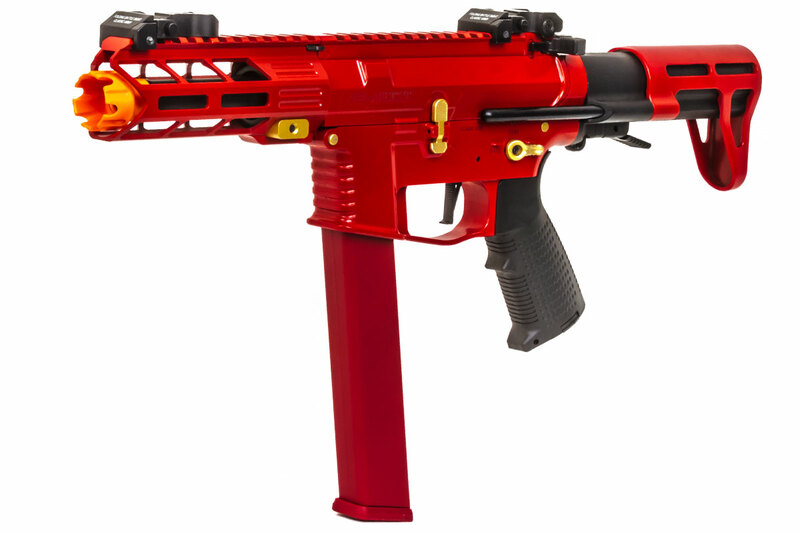 The Classic Army Nemesis series of AEGs was designed to give players of any caliber the ultimate tool to take down the opposition. Classic Army took the best parts of the Scarab line and turned them into your enemies' worst nightmare! 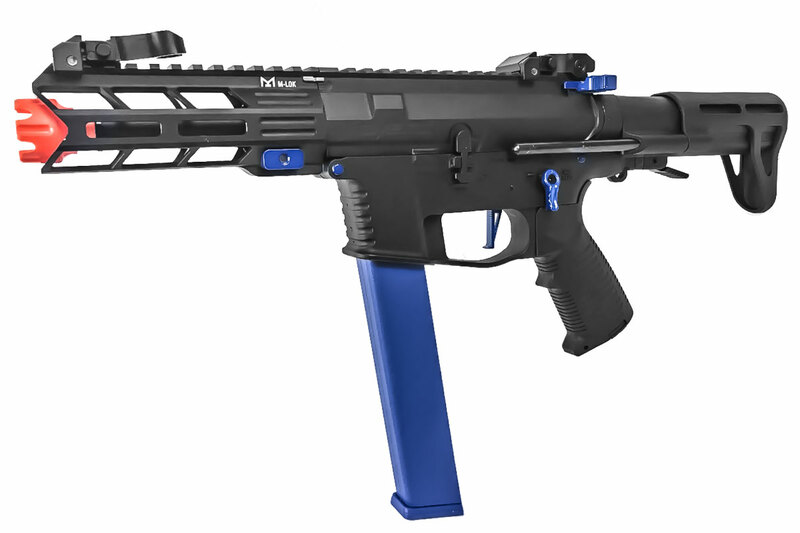 Externally, the upper and lower receiver are CNC aluminum. This gives you a super-aggressive billet-style look and ensures that both receivers match up perfectly. The X9 is perfect for players who want a sleek, compact SMG for very tight close quarters gameplay, while retaining all of the function, feel, and fire controls of the familiar AR15 / M4 style platforms. An MLOK handguard affords you the ability to mount any compatible accessories to the front of your X9 in virtually any configuration you can think of. 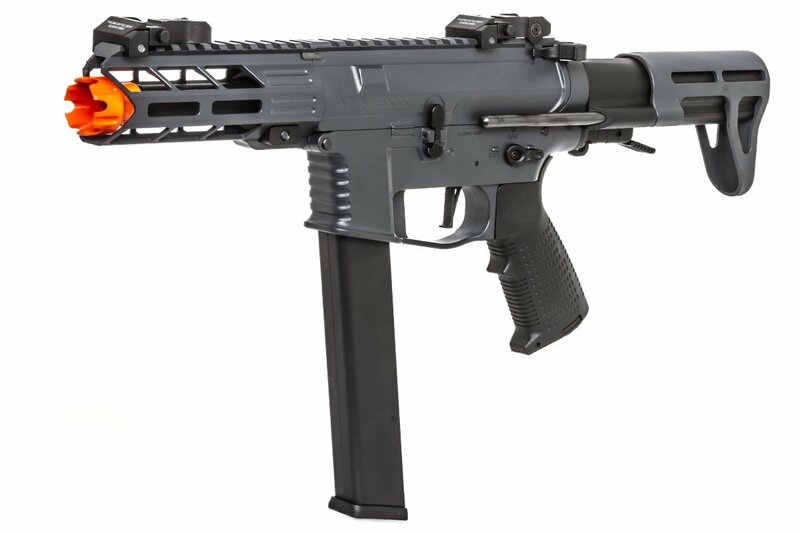 Toward the back, you will see a three-position, PDW-style stock with a unique, spacious and user friendly battery compartment latch that makes swapping out batteries on the fly a total breeze. Internally, the X9 sports Classic Army's 2018 ECS Programmable Trigger unit and Mosfet, giving you the option to set your gun to 3 or 5 round burst while providing protection for your trigger switch. 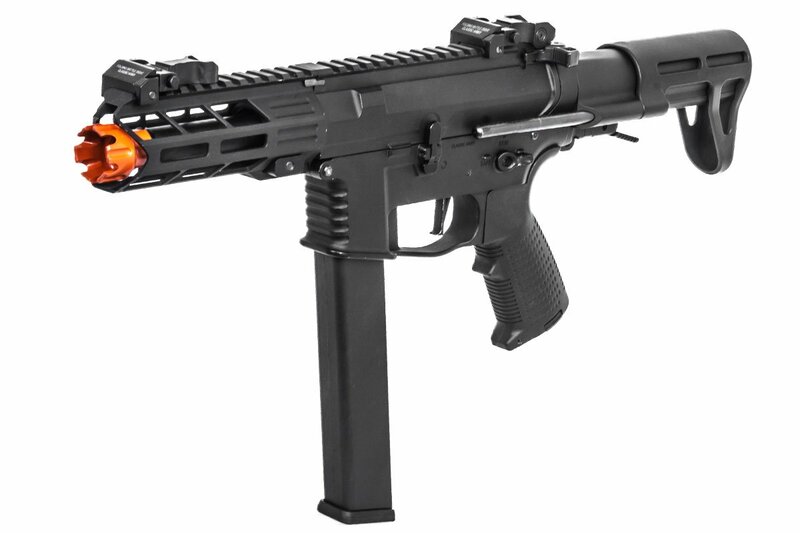 Combined with the pre-installed flat trigger system, the ECS allows for blazing fast trigger response with negligible motor spin up time - as every fraction of a second counts in CQB. To top it all off, the X9 is backwards compatible with all previous Classic Army Nemesis series AEG upper receivers, giving you the ability to swap out rail systems and barrel lengths quickly to suit any changes in environment or play style. Don't sleep on this one - grab an X9, and start kicking doors. first off i love the gun and it performs great, i got the ASGI version and it performs so well, people were asking me if i upgraded mine. but i do have one gripe which i will leave in the CONS section. the gun feels so solid and there is no wobble from it and the three round burst is so satisfying. so after 3 games the stock hopup unit split down the middle as it is plastic and caused the airseal to be absolutely ruined and caused serious feeding problems to the point where i couldnt even play with it. i havent replaced the hop up unit yet as at this time my order has not arrived. Pleased so far. ItÂ’s great for CQB. Battery compartment is the envy of all the ARP9 and Krytac PDW players. Superb trigger response and decent accuracy. ItÂ’s form make it adept for taking corners, clearing rooms, and running cover fire. The magazine works great and fits beautifully. Regarding the stock; its one of my favorite parts of the build, but...A stock removal tool needs to be made available. ItÂ’s a type of castle-nut that recesses into the fixed portion of the stock body and threads into the back of the receiver. ItÂ’s tricky to breakdown without the proper tool to remove this nut. Incidentally I hope ASGI will make this stock available for purchase in the future because thereÂ’s a lot to love about its design. IÂ’d like to use it on other Nemesis guns. Replacement battery compartment covers should be available, they fit good but not great. It has popped off mid game for me a couple times. Luckily it was recovered each time. IÂ’m in love with Mlok overall. ItÂ’s great at keeping this thing lighter in the front. I threw a Magpul MVG on the front for a short MP5K style grip. This gun practically begs for it. In the coming summer I hope it will make a serviceable secondary to a DMR or sniper rifle. I eagerly await a short version of the magazine for this purpose. 6. Overall excellent performer out of the box! 1. Flash hider is disappointing, plastic, and not as loud as other PCCs on the market. 2. Difficult stock removal without proper tool. 3. Battery compartment cap has come loose twice so far. Luckily IÂ’ve been able to recover it both times. Don't let this tiny little SMG fool you, it's a complete beast! I've run this in several backyard battles and recently at a large outdoor field. For an SMG, this little guy has a lot of range! The FPS may not be high enough to compete with DMRs, but you can send enemies running for cover. The hop-up adjustment is a little difficult with gloves but gets easier as you use it. The bolt locking mechanism is beautiful and incredibly satisfying to close. This X9 is incredibly friendly to lefties, as it has ambidextrous fire selectors and charging handle. However, the mag release and bolt release are not ambidextrous. The bolt release doesn't bother me, but with how high the mag release is positioned, getting mags out isn't as easy, especially with the 1400 drum mag. My teammates love listening to this gun with its amplified orange muzzle. Not only does it look sick, it sounds incredibly intimidating. Your enemies may be more likely to take cover from the sheer sound than the BBs that follow. Overall, an excellent gun I would recommend to everyone. Classic Army is a great brand and they show quality straight outta the box. Will it take different mags? 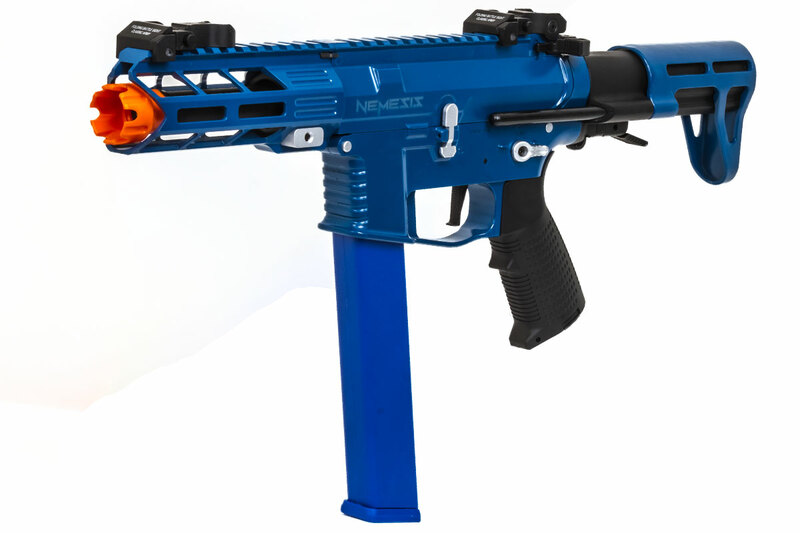 it will only take mags specifically for the Nemesis X9, however they are quite affordable, and come in a few styles, such as short, long (and long in different colors) and eventually a drum. 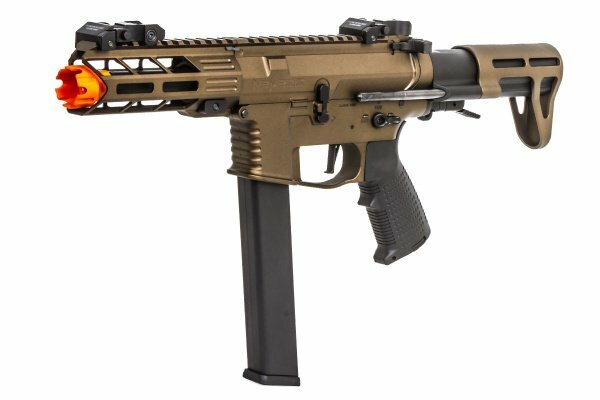 is it possible to replace the pdw stock with a standard buffer tube? 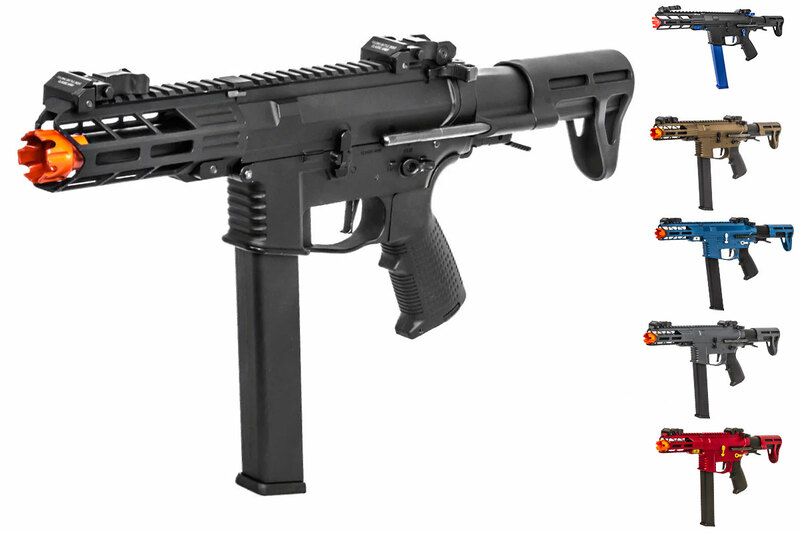 Yes you can replace it with the nemesis style stocks. Can you recommend a tracer for this gun? Is it an option right now? How do you disassemble it? It disassembles just like any M4. Also if you intend to open the gearbox, that voids the warranty. In theory also knowing I'll void the warranty, i can remove the stock flash hider and replace it with the CA 3-Prong and use the CA QD Suppressor yes? You can, but yes, you will void the warranty.